Explanation: Bright nebulae and star clusters along this 5 degree wide field of view are popular stops on telescopic tours of the constellation Sagittarius and the crowded starfields of the central Milky Way. 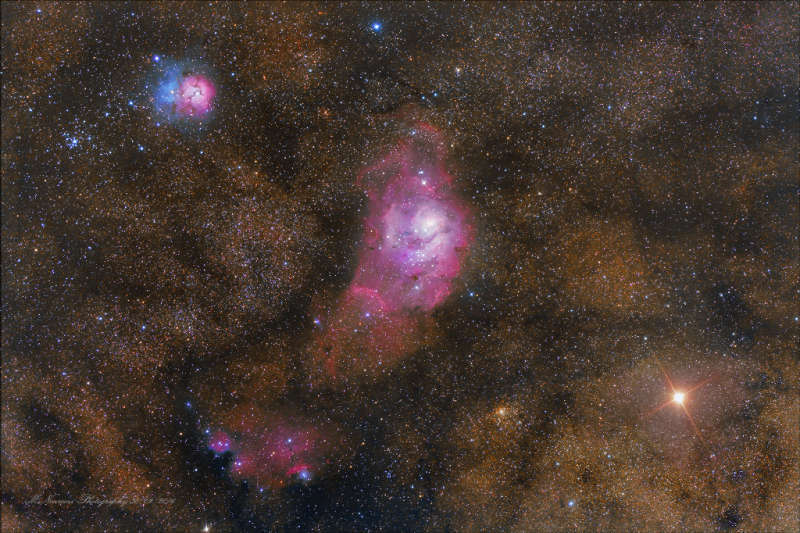 Cataloged by 18th century French astronomer Charles Messier, M20, the colorful Trifid Nebula, and M8, the expansive Lagoon Nebula, are at upper left and center. Both are well-known star forming regions about 5,000 light-years distant. Just passing through the same field of view on September 29, the yellowish star lined up with M8 and M20 at the lower right is actually Mars, close to 8.8 light-minutes from Earth on that date. That distance is nearly equivalent to 1 astronomical unit or the distance from Earth to Sun. Mars is overexposed in the image, with visible diffraction spikes created by the telescope mirror supports. Of course, Mars has long been known to wander through planet Earth's night skies.